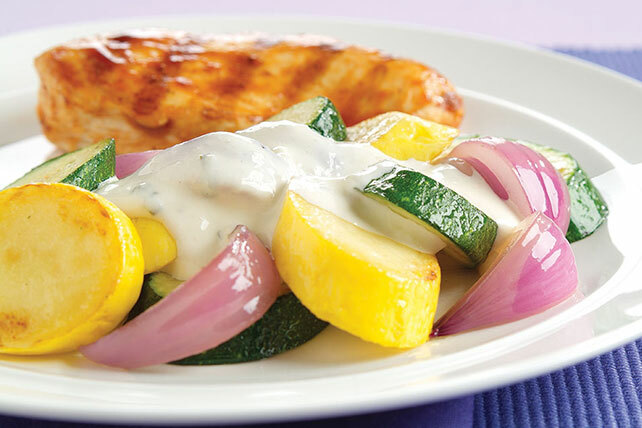 Cook veggies in a skillet then cover them with a delicious Parmesan sauce! You can make this Zucchini with Parmesan Sauce dish in less than 20 minutes. Cook and stir vegetables in hot oil in large skillet 5 to 7 min. or until crisp-tender. Meanwhile, mix remaining ingredients in small saucepan; cook on low heat until cream cheese spread is completely melted and mixture is well blended and heated through, stirring occasionally. Prepare as directed with PHILADELPHIA Chive & Onion 1/3 Less Fat than Cream Cheese. Combine vegetables and oil in 2-qt. microwaveable dish; cover. Microwave on HIGH 9 to 10 min. or until crisp-tender, stirring occasionally. Mix remaining ingredients in 1-qt. microwaveable measuring cup. Microwave 2-1/2 to 3 min. or until heated through, stirring every minute. Serve over vegetables.